You’ve heard that the desert’s heat can play some terrible tricks on the mind. You desperately hope that the scene in front of you is one of those tricks, an illusion you can simply deny and forget. The air swims and shimmers all about the edges of your vision, as the sands before you bulge with the subterranean passage of innumerable slithering abominations. Spindly horrors with dozens of chirping, chittering mouths skitter between the yawning crypts that line your path on either side. The time has come to set out into the land of Egypt and attempt to stop the rise of the dreaded Nephren-Ka, the Dark Pharaoh from an age long since passed from the memory and recorded history of mankind. Omens of the Pharaoh, an expansion for the cooperative dice game Elder Sign, is now available at your local retailer or online through our webstore! Banished from our world in ages past, an ill-fated expedition has accidentally begun to weaken the forces that once sealed away the otherworldly and brutal Dark Pharaoh. 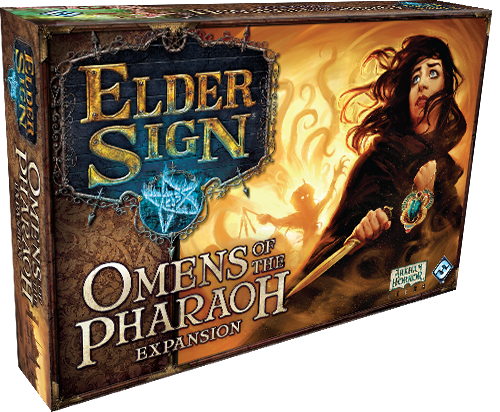 Based on the Dark Pharaoh expansion for the Elder Sign: Omens app, the investigators must find a way to stop the return of the horrifically cruel Nephren-Ka. Centuries ago, the people who suffered under this monstrous despot have wiped nearly all knowledge of his reign from the annals of human history, and now Nephren-Ka seeks to once more inflict his foul and unnatural tortures upon the land of Egypt and beyond. Nephren-Ka strains against the bonds that once sealed him away, and the pressure of his presence is a palpable force on the investigators. As the Doom Track fills, Dark Pharaoh special adventures must be completed to keep the Ancient One at bay. The investigators will need to work quickly and carefully to gather the supplies they need from the streets of Cairo. Once they’re well-armed and prepared, the investigators will want to seek out the powerful Elder Signs locked away in Hidden Chambers deep within the bowels of the ruins surrounding Dashur. The investigators will need to risk their sanity and delve deep into Dashur in order to gain the means to stop Nephren-Ka, but they must balance that with the need to retreat to Cairo when the ruins prove to be too taxing on both body and soul. Traveling between these two locales will be crucial to the fight against the Dark Pharaoh’s return. While the expedition into the ruins may have caused the Ancient One to stir after centuries of sleep, there is still much to be gained by examining the clues buried within the archaeological site. 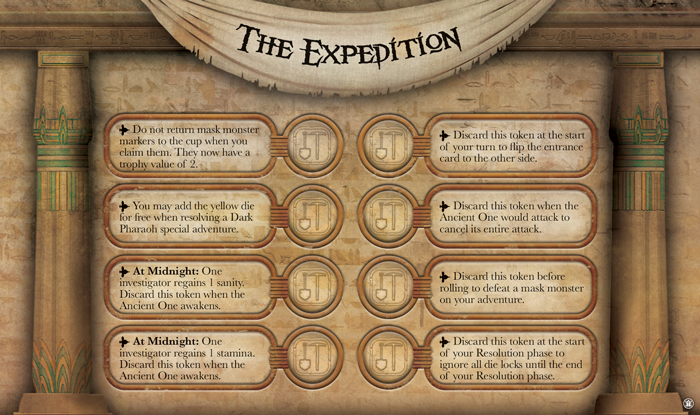 The Expedition scenario card allows investigators to gain advantages by placing tokens won from their encounters. Researching the Dark Pharaoh through these ancient clues will perhaps uncover more about the source of his foul and unnatural power. The original site of the dig isn’t the only place where the investigators can look for help. Powerful Relics can be found in the bustling streets of Cairo and the ruins beneath Dashur. 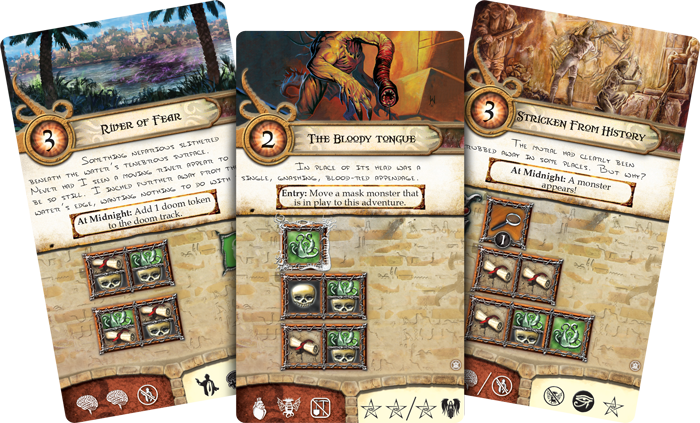 These artifacts can increase the investigators’ chances when facing the creatures that have managed to slither into the streets and sands of Egypt. Relics can commonly be used to refresh your pool of available dice when attempting to complete a task or destroy a monster, and some of these mysterious items can be paired to unlock an even greater advantage in the fight against Nephren-Ka. 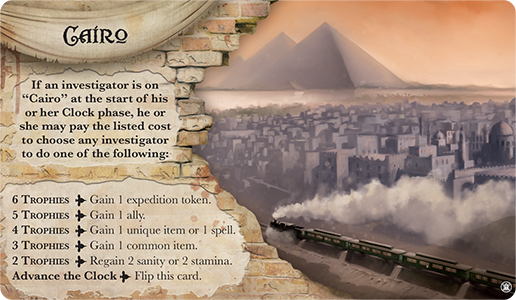 If you've already explored the dusty streets of Cairo and the foreboding ruins of Dashur, you can bring the power of Relics and the presence of Dark Pharaoh to your other Elder Sign adventures by using the Exhibit side of the Expedition scenario card when the investigators have returned to the streets of Arkham. The Omens of the Pharaoh expansion also features its own new Mythos deck, six new investigators, four new Ally cards, and three new Ancient Ones. 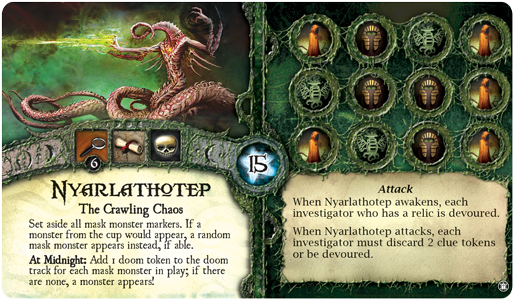 The people of Cairo speak in hushed and hurried whispers, the land surrounding the necropolis of Dashur feels ripe with foul eldritch energies, and the investigators must once more stop the looming threat of a horror thought long-dead! Are you up to the challenge of facing this ancient evil? Pick up Omens of the Pharaoh (SL20) at your local retailer or from our webstore today, and see if you can stop the rise of Nephren-Ka!